Next was a CB 160 road bike. My first off-road bike was a Hodaka 90. I used it for everything: trials, Motocross, scrambles, and flat track. After that I got a Bultaco Matador (enclosed-chain) — used it mostly for trail riding. And then an American Eagle, Husky engine 4-speed — strange bike! I acquired a wrecked ’68 Triumph, did some repairs on it and rode flat track and other events. One day I installed some lights, got a tag and used it on the road! I still have it – restored again recently as a street tracker. Everyone knows its name — “Bart”! 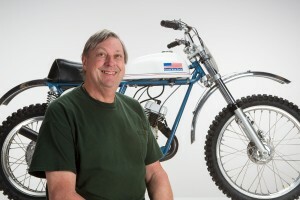 I worked at C&L Cycles as a professional mechanic from the mid-60s to 1985. I got the “vintage” bug in the late 90s and started riding ARHMA trials, then got into dual sport runs with a Suzuki DZ 400. I’m still riding that bike! Lately I’ve been messing around with Jim’s Super Pioneer.